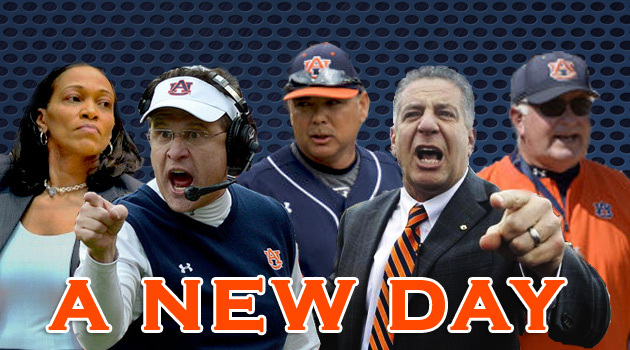 March 27, 2014 – When head football coach Gus Malzahn was hired at Auburn, he promised fans “A New Day” for the Tiger football program. That catchphrase became the rallying cry for a team that rebounded from an 0-8 SEC mark in 2012 to win the 2013 SEC crown, vanquish its two closest rivals in epic fashion and come a breath away from Auburn’s second national title since 2010. As the winds of positive change swept through the Tiger football program, A New Day spread throughout the entire athletic department. A year ago, Auburn’s athletic programs were in a state of despair. In addition to football’s well-chronicled woes, basketball, baseball and softball had all under-performed and disappointed. Over the course of the past year, despair became optimism and anticipation with a series of hires that brought a murderer’s row of coaches, all at the top of their respective sports. Women’s basketball had already started anew with Terri Williams-Flournoy, now in her second year at the Auburn helm. This season she led the Tigers to a 19-14 overall record (thus far) and a 7-9 league mark. Her Tigers made the Women’s NIT and already have two tournament wins under their belts. She was the first of a chain of dominoes that has seen changes at the top of every major Auburn sport over the last two years. On the heels of the hires of Malzahn and Williams-Flournoy the last year saw the addition of a new baseball coach, a new softball coach and now a new basketball coach. Each of the new hires has been monumental. Each new coach comes to Auburn highly respected and with championship caliber resumes. At the head of every major sport on the Auburn campus is a coach easily in the top ten in his field. It’s a drastic turnaround and one that truly started last spring with the arrival of Mahzahn. Malzahn took the Tigers to the 2013 SEC Championship and was a whisker away from bringing home the BCS title. Along the way he picked up numerous well-deserved national coach of the year honors. Optimism for the 2014 Tiger campaign is high given that many of the primary components that fueled the amazing 2013 run will return for 2014. Over the course of a year, Malzahn proved that his “gimmicky high school offense” could compete and win at the highest level of the SEC. His high level of offensive efficiency frightened rival coaches into trying to manipulate the NCAA to create rules intended to stop his yard-chewing wizardry. Those efforts failed. Lost in the furor over fast paced offenses and the advantages they provide is the simple fact that for most of his career, Malzahn-led offenses fed opponents a steady diet of rushing attempts and made them like it. It’s not trickery, it’s plain old-fashioned downhill, smack you in the face football. In essence it’s getting back to what Auburn has always done: running the ball with authority. Malzahn brought Auburn back to national prominence with a vengeance and in doing so also proved that the road to the NFL has more than one route. With an outstanding season and a phenomenal Combine effort, offensive lineman Greg Robinson worked his way into what could well be a top five pick April’s upcoming NFL draft. Some analysts have Robinson listed as the first pick, few have him lower than eighth. Robinson won’t likely be the only first round pick either. Defensive end Dee Ford wowed scouts at Pro Day. Most analysts expect Ford to be picked toward the middle of the first round. A number of other Tigers, including record-shattering running back Tre Mason, should hear their name called over the course of the draft. That’s an immediate turnaround for a program that had a total of only two players selected over the last two drafts. More than anything it shows that Malzahn knows what to do with the talent he has and that he and his staff have the capacity to make the players under their charge better. Football isn’t the only area where optimism blossoms. The Auburn softball program shows instant improvement under the guidance of new head coach Clint Meyers. In the world of softball, hiring the legendary Arizona State coach was a monumental coup. Meyers is to softball what a Mike Krzyzewski or a Roy Williams is to basketball. The Tigers are currently 29-5-1, ranked 21st in the country and recently posted three consecutive no-hitters. Auburn won consecutive SEC series over LSU and Mississippi State. With the bulk of the SEC slate still ahead, Auburn is just one win away from equaling last season’s total. Only three times in school history has a Tiger softball team won 40 or more games. That plateau is well within reach, as is the school record 50 wins set in 2005. A year ago the Tigers failed to score 13 or more runs in any game. They’ve already done it eight times in 2014. They’ve scored at least ten runs in 15 of 35 games. That’s a reason for optimism. There’s also a reason for building excitement on the baseball diamond. While not as stunning as the turnaround in softball, there appears to be a clear case of steady improvement on the Auburn baseball team. New head coach Sunny Golloway brings an impressive resume and championship history from Oklahoma where he led the Sooners to seven NCAA Regional berths, four NCAA Super Regionals and the 2010 College World Series. Golloway-coached teams failed to make a Regional once since 1998. Like the hire of Meyers was to softball, bringing in a coach with Golloway’s credentials was considered a home run in baseball circles. Golloway has the Tigers at 18-8 after some early season struggles. Auburn has taken two straight SEC series, beating both Texas A&M and Tennessee two games out of three. The Tigers are ranked 21st, their first appearance in the Baseball America Top 25 poll since April 2012. His coaching history indicates that he knows what it takes to win, knows how to survive adversity and enthusiasm remains high. Despite a sparkling new arena that brought an enhanced fan experience, the Auburn basketball program could never seem to get out of its own way. The Tigers haven’t made the NCAA Tournament in 11 years or even the NIT in five. Auburn batted over .500 in the SEC just twice since 1999. The team hasn’t had an All American since 1999 and only three since the Charles Barkley/Chuck Person overlap of 1983-1986. Auburn hasn’t had an All SEC performer since 2009 and just one that finished his playing career at Auburn since 2001. The Tigers haven’t had a player make the all SEC freshman team since 2007. It’s been a long, dreary trudge marred by revolving door rosters, uninspired play and fan apathy to match. Hope for change was ignited on Bruce Pearl’s birthday when the exiled former Tennessee coach was brought back to the hardwood to coach at Auburn. Pearl completed the coaching reconstruction that began with Malzahn. Each new hire sent tremors through the respective sports as the game’s best joined the Auburn family. The hiring of Pearl was more than a tremor, it was an earthquake that pegged the seismograph at 11. Pearl is easily the best coach available. If you were ranking SEC coaches, he’d be no lower than third. He’s top ten, maybe top five nationally. It’s the equivalent of Kentucky hiring Pete Carroll or Urban Meyer to coach its football team. Yes Pearl brings some baggage with him. The NCAA smacked Pearl with a pious hand back in 2011 for the egregious offense of lying to investigators about a cookout attended by a recruit who was on an unofficial visit to Tennessee. We could spend all day debating the inconsistencies of the NCAA; shaking our collective heads at their capricious and uneven record of punishment; wondering for the hundredth time how clear and obvious transgressions can be ignored or wiped away while others are rebuked and reprimanded for the most minuscule of offenses, but why churn that same chum again today? Pearl brings an excitement to the Auburn basketball program that it hasn’t truly experienced since Charles Barkley was dunking over, well, pretty much everybody and Chuck Person was rifling what would be three-pointers in today’s game. Pearl is a proven winner at every level. Seventeen times in nineteen years of coaching, Pearl led his teams to the NCAA tournament. At Tennessee he helped bring the Volunteers their first ever number one poll ranking. Beyond that, Pearl is charismatic and dynamic, enthusiastic and emotional. His plunge into fans at the airport is exactly the type of energetic kickstart the moribund Auburn basketball program needed. His jersey and helmet-wearing appearance on ESPN, where he lauded and praised Auburn probably gave the Tiger basketball program as much national exposure as its gotten in the last decade. It’s no stretch to say that Auburn basketball has wandered the desert for a long, long time. Back in 1981 a tough, charismatic coach took over a football program at Auburn that had lost its way. We know how that turned out. Pat Dye changed Auburn football and in the process changed the face of Auburn itself. Pearl now has that same challenge at Auburn. The Tiger basketball program hasn’t just wandered the desert, it’s taken up residence in the middle of the Sahara for more than a decade. Jeff Lebo and Tony Barbee, both good coaches and men of quality, failed to move the Auburn needle. Pearl’s undeniable coaching prowess, energy, enthusiasm and charisma is on the clock. It’s a New Day. We’re optimistic. Still not sold on Jay Jacobs but you have to give credit where it’s due. It’s been a long time since the overall athletics program had this much momentum.